Please join us in welcoming Rob Fanfant N7QT to the VP6D team. You may view Rob's CV on the Team Page. We are pleased to announce the receipt of a significant financial grant from the American Radio Relay League's Colvin Award Committee. 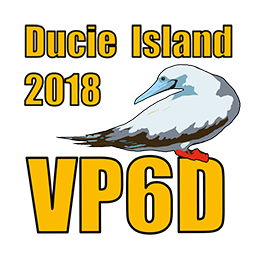 We appreciate the confidence the ARRL has shown in the VP6D project and to the team. Congratulations to the Baker Island KH1/KH7Z team. Under extremely poor propagation conditions they put on a excellent DX-pedition. They proved the value of FT8 DXpedition mode and gave many ATNOs to the deserving. A hearty WELL DONE to the Dateline DX Association. During the VP6D DX-pedition we will activate our Garmin inReach when we leave Mangareva. It will remain on until we return to Mangareva. The unit has SMS messaging capability for communication between team members and their family.